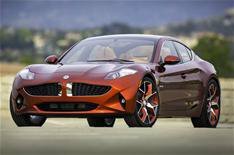 New York 2012: Fisker Atlantic revealed | What Car? This is the new Fisker Atlantic. The Fisker Atlantic is a saloon thats smaller than the company's first model, the Karma. It's roughly the same size as an Audi A5 Sportback. The Atlantic will be a rival for the Audi, as well as compact saloons such as the BMW 3 Series and Mercedes C-Class, and larger models such as the BMW 5 Series and Mercedes E-Class. Although the Atlantic has similar styling cues to the Karma, it has a more dramatic rear end, rear door handles integrated into the rear pillar and a glass roof that exposes the structure of the car underneath. Fisker says that the Atlantic (which has used the code named Nina until now) will be more practical than the Karma, despite being smaller. Like the karma, the Atlantic is an range-extender electric vehicle, like the Chevrolet Volt and Vauxhall Ampera. An electric motor drives the wheels; the batteries can be recharged by plugging the car into a socket, but theres also a petrol engine that acts as generator on the move, all but eliminating range anxiety. Rear-wheel drive will be standard for the Atlantic, but four-wheel drive will be an option. This version would also form the basis of a closely related SUV model that Fisker is expected to add to its range. The Atlantic is the first Fisker to use BMW's turbocharged four-cylinder engines. It also has a new multi-speed gearbox, instead of the one-speed direct-drive system that's used for the Karma. This allows Fisker to fit one electric motor instead of the two that the Karma needs, which improves the packaging and helps to free up cabin space. An Atlantic production model is due in 2013.